I'm back with some more gift giving ideas for the Holiday Season....For my projects today I'm using the JustRite Baking Ensemble and some products from Tastefully Simple (if you need to order any products click here) to make some easy gifts! 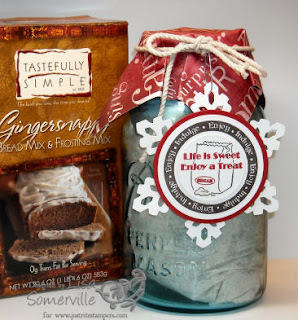 For my Gift in a Jar - I simply opened my box of Gingersnappy Bread Mix, placed the bag of mix in my mason jar, placed the frosting bag on top, then screwed on the lid. I used markers to color the center image of my Baking Ensemble, and cut it with my circle nesties. I stamped the border in chocolate chip and cut my remaining circles. I adhered this to my Snowflake Die #2 for a festive look. I printed the directions on another piece of card stock and adhered it to the back. (See photo below) I then cut a piece of Holiday DSP and placed it over the top, and tied it with my Rope Twine. The Snowflake tag is attached with a piece of Silver Elastic Cording. 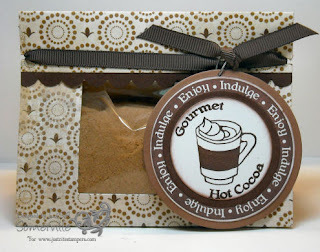 My second gift item is also made with the JustRite Baking Ensemble - a perfect stamp set for your Holiday Gift Giving. For this gift I scooped some English Toffee Mocha Mix into a small cello bag, and sealed it. I printed out directions and attached them to the back of my tag. Score at 3-1/2", 5-1/2 and 9"
I then cut a rectangle with my Rectangle Nesties, so the recipient could see what was inside, and added my Scallop Edge. Remember I mentioned the other day I'd have a few tips to share. Conditioning your stamps is important to get full ink coverage of your images. See my example below. 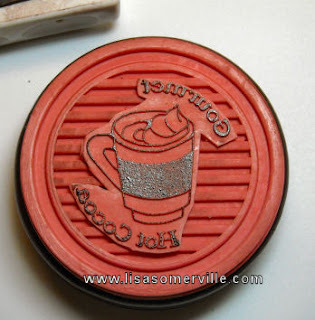 I like to rub some Stazon Cleaner onto my stamps then gently rub my stamp with my sanding block. I then drag my stamp across a piece of scrap paper. I then ink my image and do a test run to see if my inked image is solid or not. If not, I repeat my steps until I'm satisfied. 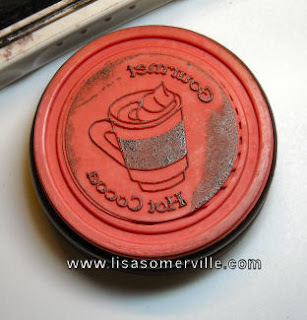 Be sure to check out Sharon Johnson's Blog for more tips on conditioning your JustRite Stamps. Also, don't be afraid to trim your JustRite Stamps - just like you would any other stamps that you mount. 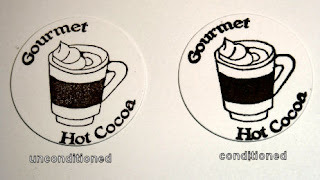 As you can see the photo on the left shows my JustRite stamp inked - and my ink is on the circle part - which means when I stamp it will transfer to my card stock. By simply trimming away the excess rubber my image will stamp just the way I want it with no extra ink smudges. If you do end up with any ink on your stamper, simply wipe it off with a Q-Tip, and your all set! 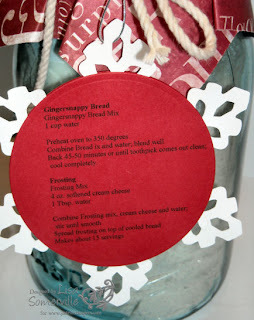 I hope my gift ideas have inspired you to create some Holiday Gifts! You are making me hungry GF! What a great gift! and thanks for the conditioning info too!